Renovated in 2009, the El Dorado golf course features a modern layout that has become a favorite public golf course in Houston. The rolling terrain is beautiful and the undulations are unexpected for a golf course in the area. Numerous lakes and creeks make it a visually striking golf course. With 4 sets of tees that are well-spaced, the design is fair for beginner golfers and and still tough for good players and professionals. If the fairways were narrowed and the rough grown out, many believe this golf course could host a PGA event. Billy Ray Brown (PGA Tour Winner) said, "... a great job designing a new course that keeps it up with the times." Before or after your round, enjoy hearty food and friendly service in a relaxed atmosphere and spacious restaurant or outdoor patio. We also have free WIFI available for guests. MON - FRI: The grille opens at 11AM, but fresh breakfast biscuits or tacos are made fresh every morning and are available in the golf shop starting at 6:30AM for just $1.50/item along with delicious Columbian coffee. Sports drinks, beer and snacks are also available for purchase in the golf shop. SAT & SUN: The grille opens at 6:30AM. 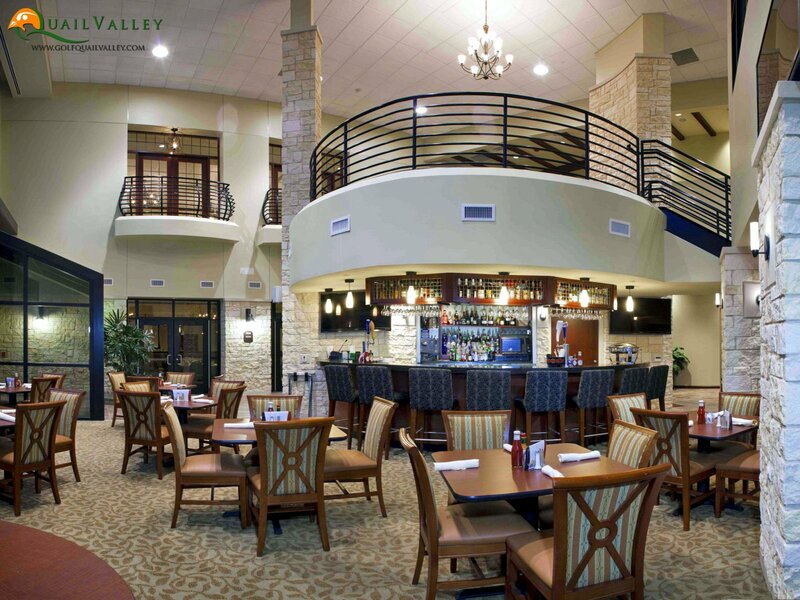 Dine inside or on the patio to enjoy views of the golf courses and sunsets in the evenings. Table service is provided and the staff at Quail Valley works hard to make sure guests enjoy themsleves or have fun here. If you need to clean up after a day out at Quail Valley, we have beautiful, clean and contemporary restrooms that have lockers and double-curtained showers for your privacy. To inquire, call 281.403.5910 or click below for more information.